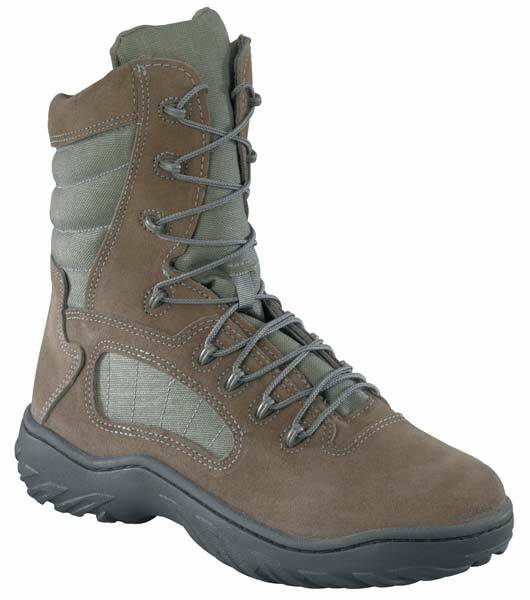 The Reebok Sage Green Womens Fusion Max Air Force Uniform boots are built in the USA and made tough enough for the military but comfortable enough for everyday wear. Lightweight and breathable, these ladies 8-inch military boots have the perfect balance you need on your next mission. Built with a sage green Suede leather and Cordura nylon upper, the Reebok CM999 Womens Air Force boots are extremely durable but still flexible enough for extreme maneuverability. All the hardware on this 8-inch Reebok boot is non metallic and Airport friendly so you'll have no worry about rust or corrosion. And thanks to the RECON Rugged Terrain outsole on these sage green military boots you'll be ready for action in any environment. Inside these American made Reebok Ladies uniform boots you'll find non-metallic shanks, dual-density ball and heel cushion, and Reebok Shock Eliminator technology that provides support and comfort all day long. A moisture wicking lining pulls sweat and other moisture away from your foot, keep you dry, cool, and comfortable even when you are most active. On the job and off, the Fusion Max CM999 tactical boots are sure to perform! The Fusion Max line of Reebok boots all include Total Cushioning Technology, or TCT. TCT provides your feet with the layers and layers of cushioning you need to stay comfortable. Five layers under the heel, and three layers under the forepart of the foot mean one thing; 1 1/2 inches of deeper, total cushioning for amazing comfort and impact protection. The top most layer that extends throughout the insole is a PU insert that is 33% softer and thicker that an athletic cushion insert. Layer number 2, in the heel, is a gel cushion that equally distributes impact and under that is a shock eliminator that absorbs the initial heel strike. The fourth layer is a closed cell total cushion that provides a soft but firm comfort bet for the entire foot. And last but not least is the polyurethane outsole that resists wear and tear but still absorbs shock. Combine all that with all the other great features of the Reebok CM999 Womens Fusion Max 8-inch Sage Green Military boots and you get one tough boot that can't be stopped. Proudly made in the USA. Order yours online today!